In this article, we will show you how to colorize your black and white photo and suggest the tools you can use to achieve the best results. Let's explore different ways of colorizing monochrome photos. Editing photos online is an efficient way to avoid having to deal with countless options provided by photo editing programs, since you edit a photo in a short period of time. Here's how you can colorize a photo with an online tool. People in need of an automatic way to add color to a black and white photo will have a good time using the Colorize It microservice, provided by Algorithmia. All you need to do is upload your photo or paste the URL from the place on the Internet where you already uploaded your photo and click on the Colorize It button. The algorithm will then automatically add color to your photo, and once the colorization is complete you'll be able to see the before and after photos. Adobe Photoshop is an almighty tool that lets you do anything you want with your photos if you know how. Although colorizing a photo in Photoshop doesn't take more than half an hour, it is a rather complicated task for someone who has never used this software before. Furthermore, Photoshop isn't free so if you are not considering a career in photo editing, GIMP may be a better choice for colorizing photos. GIMP is an Open Source photo editing software that features nearly all of the options Photoshop has to offer. Whichever of these programs you decide to choose you'll have to know how to change the mode to CMYK and experience with working with multiple layers will certainly help you save a lot of time. What's more, in order to colorize a black and white photo, you'll need a considerable level of skill in fine-tuning tones and colors, but this process may seem difficult only the first time, because with time and practice it becomes nearly a routine operation. The best way to colorize a photo is to use photo editing software, and if you need assistance you can click here and follow this step by step tutorial. Even if you are a highly skilled photo editor you'll still need some time to add color to a black and white photo, but a software like Fotophire can help people who'd like to colorize a photo in just a few clicks. Wondershare's photo editing software features numerous photo filters that can be applied to a photo with a single click. Filters such as Blue Wash or Cross Process can add color to your photo within seconds. It is worth noting that once you apply a photo filter the color will be applied to an entire photo, so the result you'll get may not be a photo that has realistic colors. However, once you've applied the filter you can head over to the Adjustments menu where you can try to achieve a more realistic look on a photo by tinkering with Temperature, Hue, or Tone Curve options. The abundance of features offered by Fotophire will allow you to decide exactly which colors you want to add to your photos, and you can also fine-tune the intensity of the colors. This software is so easy to use that you can colorize a photo effortlessly even if you've never done it before. After colorizing the black & white photos, you can take advantage of Fotophire Slideshow Maker, an easy-to-use photo slideshow maker, to make an excellent photo or video slideshow in 3 simple steps. Adding color to black and white photos is a fairly simple process that doesn't require you to be a photo editing magician since most Smartphones offer presets or filters that will automatically add color to any photo. iPhones offer a lot of built-in photo filters that will enable you to colorize a photo in a split second, but if you would like to use an app that's designed specifically for colorization of photos you can try using an app such as Wondershare Filmora. This app is free of charge and it provides its users with numerous features that enable them to manipulate color in any way they want. Recolor option lets you change the color of any detail in your photo, and it can be used efficiently to colorize black and white photos. However, the Recolor feature isn't free and if you'd like to utilize it, you'll have to purchase it for $3,99. 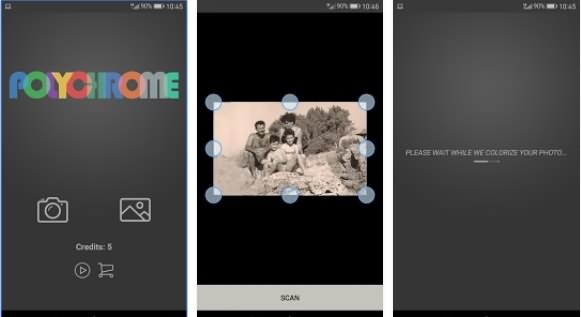 Old family photos or any other black and white photo can be easily colorized on any modern Android phone. You can use some of the filters offered by your phone, but the results you'll get may not be impressive, which is why an app like Polychrome, can help you colorize your photos properly. The app uses Machine Learning, and with each photo it colorizes it becomes better. The process of adding color to your black and white photos is automatic, so all you need to do is choose the photo you want to colorize and wait for the app do its magic. Photos often capture memories and with the passage of time these memories fade into black and white, each of the techniques for colorizing photos we described, will bring back your memories in vivid color. We'd love to hear which technique for colorizing photos you like the most, so feel free to share your thoughts with us in the comments.